September means cooler temperatures and the approach of autumn, but it also means time for the Great Frederick Fair. A multitude of food vendors, lots of carnival rides, and assorted livestock shows make this event one of the outstanding affairs of September. No matter what kind of lunch or dinner fare you’re craving, you will find it here. The sign on one food vendor’s trailer for Crabby Patties invites fair-goers to try the crab cakes. But pizza, sausage, pit beef, cinnamon rolls, and fresh-made ice cream are also on the menu, along with an almost infinite number of other options. Ticket choices for the rides range from single tickets, sheets of tickets, and special promotions on certain days. 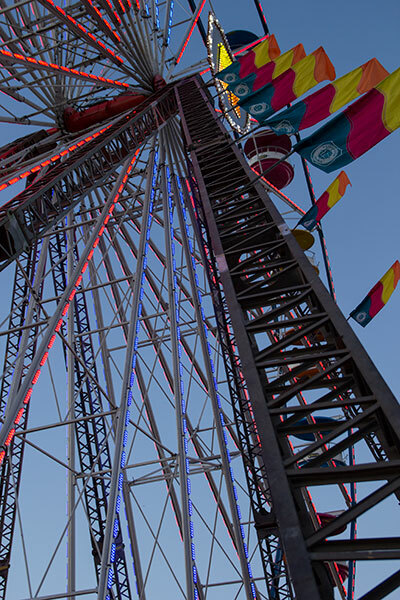 When the sun goes down, the multi-colored lights on the wide variety of rides call to fair-goers. A multitude of baby animals will delight fair-goers; piglets, calves, and ducklings are among recently birthed offspring at the fair. Visitors can follow new arrivals in the birthing center at the fair. Sheared sheep in colorful jackets talk as visitors walk through the barns; roosters crow, cows moo, and goats bah at guests. The fair boasts an app, available in the App Store and the Google Play Store, to help visitors navigate the event. Users can follow the Twitter conversation by searching #2013gff or following @GrFrederickFair. The fair runs through September 21, 2013.